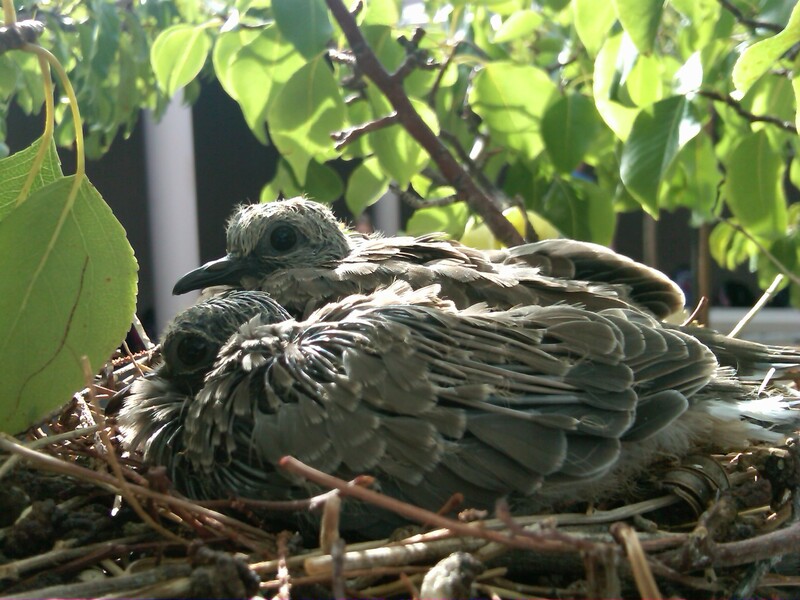 These birds are in a 5-foot, near-dead tree right in front of Seth's classroom. It's my mom's 70th bday and I'm on the floor of her suite sick as a dog. Headache, aches and fever. Missing family dinner now. Jeesh. World's greatest exercise machine. 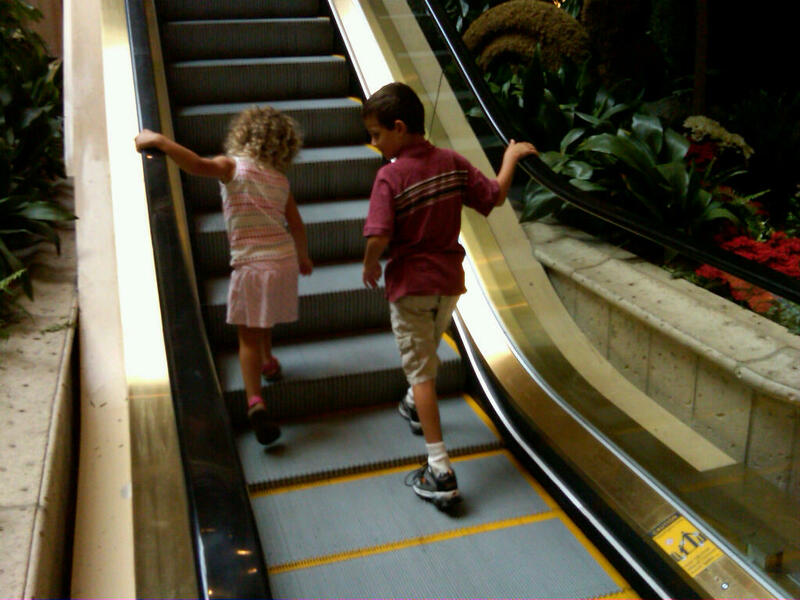 Seth and Lael go the wrong way up the escalator. Man, so much to do, so little time. The kids go back to school in just two weeks. Two weeks! I knew it would happen some day, and today was the day. Seth took his first first in the breast stroke. Good deed of the day: A woman slipped on ice cream (painted concrete floor) and started to fall on Lael and Seth who were eating ice cream. Instinctively, I grabbed the woman's arm -- the woman was walking between me where I was standing and the kids -- and caught her. I'm pretty sure the woman would have crashed clear the ground, pinning Lael beneath her. To be honest, I didn't know I could move that fast. Regardless where you stand on Arizona’s illegal immigrant bill, which puts pressure on police to identify and arrest suspected aliens, this state’s children will be the biggest losers when the law soon goes into affect. There are obvious reasons: Children face the risk of deportation along with parents. Or parents might be arrested and deported without their children. And children will pay the price for the portion of law that allows the state to recoup legal fees from already impoverished parents. There is another problem, though, that is only now making the news. Like other states, police officers are assigned to public school campuses. Under federal rules, schools must provide an education to all children, legal or not. From educators’ perspective, these rules apply to the on-campus police. But Russell Pearce, the state senator who authored SB 1070, wants campus police officers investigating children who they suspect being illegal immigrants, reports the Arizona Capitol Times. I always knew that eating too much junk food – or cereal for that matter – could make you sick to your stomach. But how about getting sick before eating Apple Jacks or Froot Loops? Apparently, something has gone wrong with the packaging of some Kellogg’s cereal packages, which are emitting a strange, off-flavor smell, reports the Food and Drug Administration. As often the case, the FDA says don’t worry about any health problems; nausea or diarrhea won’t kill you. Wait a minute, doesn’t pooping problems imply someone ATE the cereal or gave it to their kids despite the smell? Just saying. When my wife was pregnant with Seth, we did what a lot of families do: we went to Babies R Us and picked out our favorite crib. We wanted a drop-side convertible so that it would grow with our child. A relative bought us the crib, but it never made it to toddler bed. We wound up getting Seth a slide bed and Lael a metal-framed white bed. In fact, all that we have left of the crib is the headboard, which is gathering dust in the garage. Considering all the recalls of drop-side crips – more 2 million were affected by today’s announcement – I suppose it’s for the best. The recall brings the total number of cribs that need to be fixed up to 9 million, reports WebMD. “They outsource the manufacture of these cribs and are using very inferior hardware to make the side go up and down,” says Consumer Reports safety expert Don Mays. Another problem is poor quality instructions, which leads to upside down assemblies. So I was on the phone with my mom looking for a place to celebrate Seth’s 8th birthday when it struck me that CrackerJax might be the right choice. The place has miniature golf, go-karts, video games, lousy food, etc. So I go to the website when suddenly a photo of two kids driving go-karts pops up. So who else thinks we should get free lifetime passes?